Despite the often used named of Shoebill Stork, Shoebills are not in the Stork family. Shoebills are native to central Africa. Shoebills often hunt for prey in areas where pools of water are drying out. Shoebills eat fish, frogs and small mammals. Shoebills have unusual hunting styles, where they plung or fall on their prey. Shoebills have sharp bills and can use it to chop up their prey before eating. Shoebills are large birds that can reach 4 to almost 5 feet in height. Showbills are usually silent birds. Shoebills move slowly and have a tendency to stand still for long periods of time. Shoebills will pour water on their eggs on extremely hot eggs to cool the eggs down. 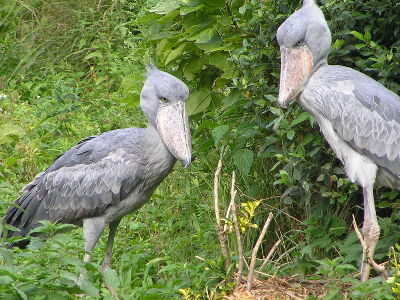 Male and female Shoebills look alike. Shoebills often live in papyrus swamps and will nest on floating vegetation.